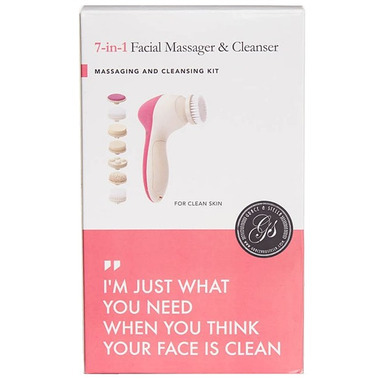 Wish you had a tool that quickly got rid of all the dirt and makeup that's been sitting on your face all day long? Look no further! 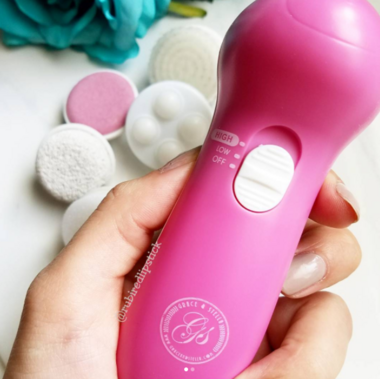 Instantly slough away dead skin and remove stubborn makeup with Grace & Stella's 7-in-1 Facial Spin Brush Massager & Cleanser. Massage and stimulate blood flow to your face simply by changing the brush head. There's a brush head to fit your skin needs. Brush comes with 7 heads. Slide the button up or down to change the speed setting. Use for about one minute to avoid possible irritation from over-exfoliating. Please note: This spin brush is water ﻿resistant﻿, not waterproof. Do not completely submerge device in water. This product is unfortunately very cheaply manufactured. The bristles are made of some kind of synthetic plastic that scratches your face. It truly hurt my face scratching it. I would return it if I could not worth your purchase !!! Get this brush. Its amazing. The price is amazing. Buy some for your friends too!